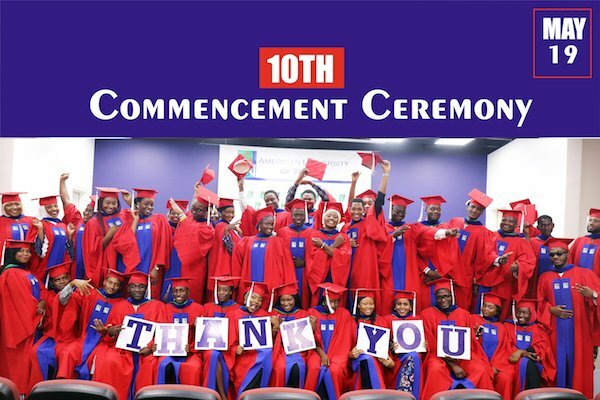 The American University of Nigeria will graduate its 10th class including potential, budding entrepreneurs at a Commencement Ceremony scheduled for Saturday, May 19, at its main campus in Yola, the Adamawa State capital. A major highlight of the next Commencement will be the formal inauguration of Dr. Dawn Dekle, the American educator who mid-2017 assumed the leadership as the fourth substantive president. The Chief Executive and co-Founder of Flutterwave, Mr. Iyinoluwa Aboyeji, is this year’s Commencement Speaker; Board of Trustees member and ninth President of Marlboro College, Vermont, the United States, Dr. Kevin F. F. Quigley, will give the inauguration remarks during President Dekle’s inauguration. Dr. Quigley is an internationally recognized leader and educator who leads a progressive liberal arts college modeled on the Oxford-Cambridge system of seminars and tutorials. Flutterwave is an intercontinental payments technology company through which Mr. Aboyeji connects Africa to the global economy with one Application Program Interface (API) for processing payment across the continent. The youthful entrepreneur has other accolades to his credit. They include World Economic Forum Global Shaper (2012) and Forbes 30 under 30 Most Promising Young Entrepreneurs in Africa (2015). Over the years, AUN has had speakers of international renown. The list includes Archbishop Desmond Tutu (2009), Dr. Haroun Al-Rashid Adamu (2010), the EU Ambassador to Nigeria Dr. David MacRae (2011), founding BoT member Dr. Robert A. Pastor (2012), and veteran civil rights champion Ms. Charlayne Hunter-Gault (2013). Others are Ambassador John Simon (2014), Colombian educator Vicky Colbert (2015), and a former commissioner for finance in Lagos State, Dr. Mustapha Akinwunmi. This is not Dr. Quigley’s first time at AUN, as the former national president of the American Peace Corps Association was the guest speaker at AUN’s first-ever Convocation & Pledge Ceremony in the fall of 2012 when he asked matriculants to embrace service as a sacrifice for community, country, and continent. Unveiling the event lineup the Commencement, the Vice President for University Relations, Abubakar Abba Tahir, said the university feels honored to have these guests accept its invitation. On the Commencement eve, there will be a banquet to bestow graduation awards on deserving students. This event publicly recognizes and celebrates the accomplishments of the graduating seniors. Before then, on May 17, all graduating members of the AUN Honor Society will be invited for an award banquet. These students are considered the cream of the graduating class.